16 | March | 2019 | Azazel's Bitz Box. 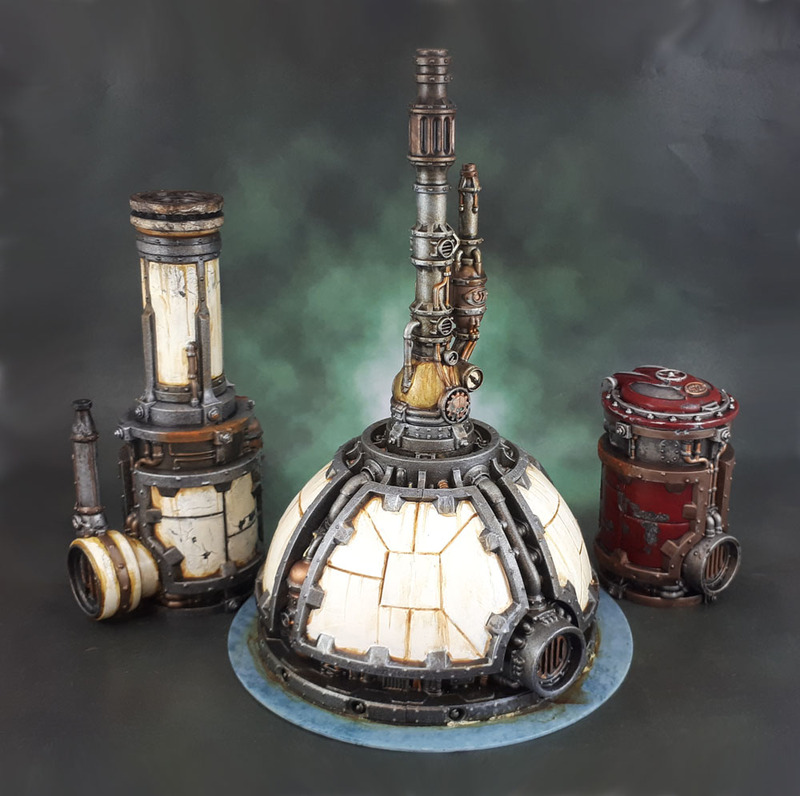 I have the final piece of this first wave of my Mechanicus Terrain this evening. A piece based on the core of the same pieces as the first one. And of course, the “family photo”, as I’m about to become much busier on Monday, which will slow down my production again no doubt. As you can see, this piece has a mixture of the techniques used on both of the previous ones. 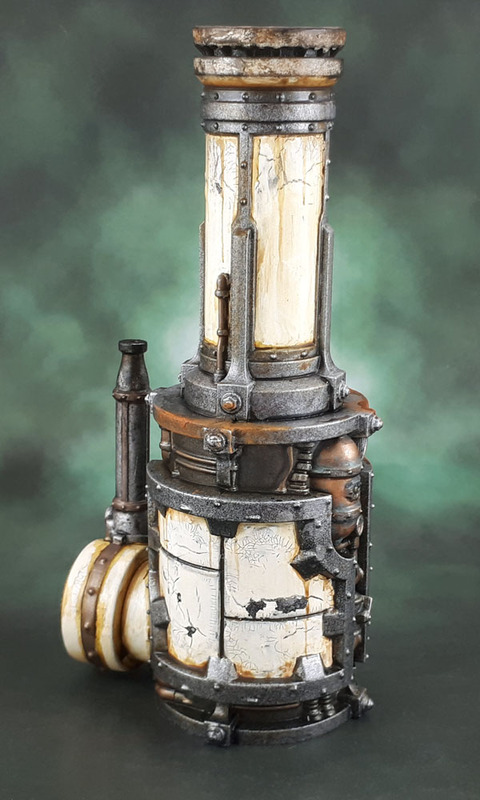 The same “off-white” scheme as the dome, with the grime streaking combined with the rust effect, occasional bit of model-gouging and chipped paint of the first piece. I’ve also managed to get the crackle paint to work properly on this one as well, which gives the chipped paint a nicer, worn effect. 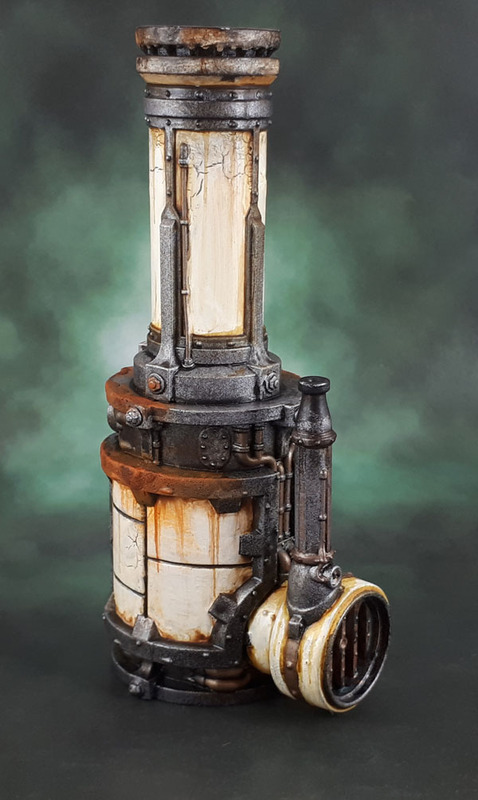 I still have three more “test” Mechanicus pieces that are still WIP, and they’ll have to be my “second wave” of models for these, as I need to clean up where I was working on them now – and none of them are particularly far along. I’m pretty happy with this one overall, but I feel like I also need to mix up the colours further. I’m not going to “skittles” these things, but a bit of Necromunda blue and Industrial Green for some of these pieces I think will work well enough. The trick will be simply to deploy them in “clusters” of the same colour as often as possible, so they look like a cohesive collection of machinery/objects in different areas of the table rather than the mess that will be if I mix them. 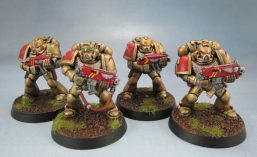 I’ll probably have to have a few “silver/metal” pieces that I can use to unify everything and intersperse with the coloured pieces.